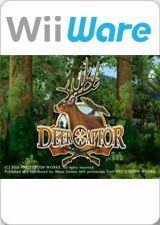 Deer Captor offers an immersive hunting experience. Choosing from a rifle or crossbow, players can put their marksman skills to the test as they try to capture a variety of wildlife such as deer, hares and kites in the comfort of their living rooms. Aim for a high score in Instant Mode, where the objective is to capture as many animals as possible within a set time, or test your mettle in Mission Mode, where you must complete a series of objectives to advance to the pinnacle of the hunting world. Play against your friends and family in friendly competition, or post your single-player score to online leaderboards for nationwide bragging rights. The graph below charts the compatibility with Deer Captor since Dolphin's 2.0 release, listing revisions only where a compatibility change occurred. This page was last edited on 12 January 2018, at 06:09.